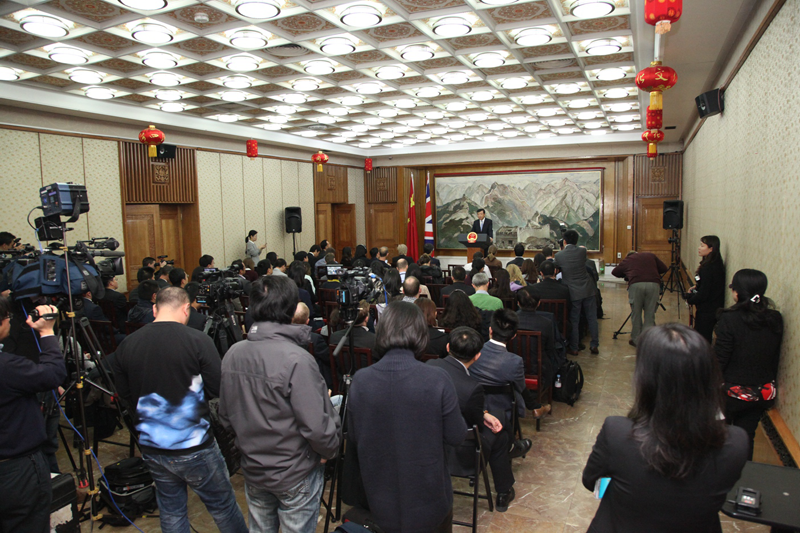 Welcome to the press conference at the Chinese Embassy. At the invitation of Her Majesty The Queen, Chinese President Xi Jinping will pay a State Visit to the United Kingdom. This is going to be the first State Visit to the UK by a Chinese President in ten years. It will present a major historic opportunity for China-UK relationship. I have recently met extensively with people from all walks of life in the UK, including the Buckingham Palace, the UK Government, the Parliament, the business community, the academics, universities and media groups. In those meetings, I could clearly feel the enthusiasm and expectations here in Britain with regard to the State Visit. It is a shared hope that the state visit will lead to greater progress in China-UK relationship and will bring impressive outcomes. Right now, preparations are in full swing both in China and here in the UK. Though I can not, at this moment, give every detail of the programme, I want to share with you four major features of the State Visit. The first is the great significance of the state visit for China-UK relations. This year marks the beginning of the second decade of China-UK Comprehensive Strategic Partnership. It is described by Prime Minister David Cameron as a "golden year" for China-UK relations. There is nothing more befitting than a state visit in a "golden year". During the visit, President Xi Jinping, together with the British leaders, will give China-UK relations a new position. They will set new goals and draw up new blueprints for the bilateral relations. Therefore, the State Visit will be a significant landmark between the past and the future. It will mark a new milestone and herald a 'Golden Era' for the relationship between China and the UK. The second feature is the extraordinary arrangements for the State Visit. • A State Banquet hosted by Her Majesty The Queen. • A banquet in the City of London at the Guildhall. • And the honour of a 103 Royal Gun Salute. This involves 41 guns in Green Park and 62 guns at the Tower of London. But the State Visit this time is more than usual. There are a number of "pluses".  President Xi and Madam Peng Liyuan will meet all three generations of the British Royal Family.  President Xi will make a speech at the British Parliament.  In addition to official talks with Prime Minister Cameron, President Xi will be joined by the PM at multiple events in London and during the visit to Manchester.  President Xi and Madam Peng will also visit the PM and Mrs. Cameron at Chequers. The Chinese side likewise attaches great importance to the State Visit. In previous overseas visits, the Chinese President usually toured a number of countries on one trip. But this time, it is going to be a one-destination State Visit. President Xi's State Visit will take him to only one country. That is the United Kingdom. All these facts are pointing to a Super State Visit. The third feature is the rich variety of events during the State Visit.  President Xi will visit London and travel out to Manchester.  He will tour the urban area and catch a glimpse of the countryside.  His programme includes both traditional ceremonies and modern creative display, both official talks and meetings, and lighthearted cultural and sports events.  There will be exposures to UK's high tech corporation and well-know institution of higher learning as well as a tour of a Chinese telecom business based in the City.  He will join the business communities at a China-UK economic and trade forum and attend a conference of Confucius Institutes.  The visit will be a great opportunity to both make friends with people from all walks of life in Britain and renew ties with old friends who have contributed to China-UK relationship.  The programme for Madam Peng Liyuan is also designed to reflect her responsibility as UNESCO Special Envoy for the Advancement of Girls' and Women's Education. So, the State Visit will be full of highlights and excitements. There will be a great deal for all media to report and reflect upon Please stay tuned. The fourth feature is the fruitful outcome of the State Visit. During the state visit, government departments of both countries will sign a number of agreements aimed at furthering China-UK economic, trade, cultural and people-to-people cooperation. The businesses communities also have plans for major cooperation. The details of those still need to be worked out but we will keep you posted. Both China and the UK are great countries. Both China and the UK had made our contribution to human civilization. Both China and the UK are countries of global influence. At present, both our countries are tasked with deeper reform, economic growth and better life for the people. As we seek growth through reform and innovation, we regard each other's progress as major opportunities for our respective growth. We find great potential in each other's key development initiatives. A robust China-UK relationship is therefore in the fundamental interest of the people of both countries. It is good for global prosperity and world peace. 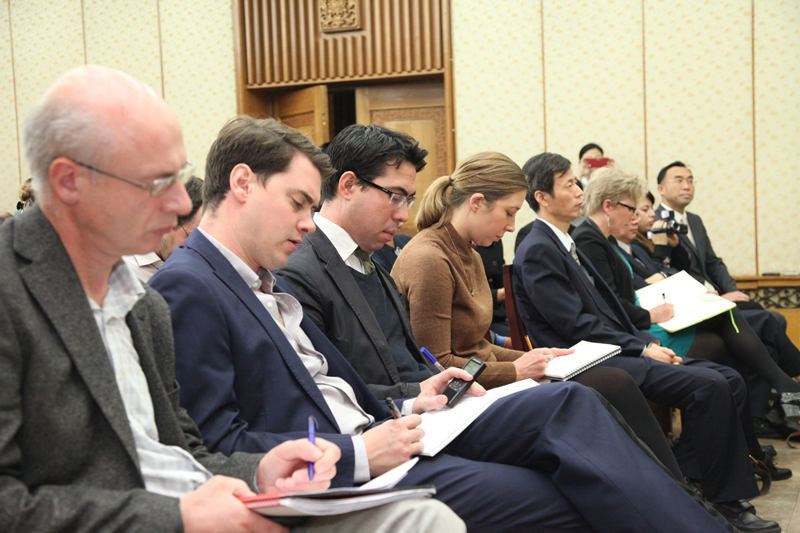 Last year, at a similar press conference right here at the Chinese Embassy, I expressed anxiety to the media that the UK was lagging behind some European countries in its relations with China and had some serious catching up to do. Today, I can happily and confidently say that the UK is coming up from behind, that the UK is committed to becoming China's "strongest supporter" and "best partner" in the west. In fact, when it comes to developing relations with China, the UK is becoming the leader in Europe and indeed the West. The Anglo-Irish philosopher Edmund Burke once said, "Great men are the guideposts and landmarks in the states." May I say that great men are also guideposts and landmarks in state-to-state relations. Let us wish the "Super State Visit" of President Xi Jinping a complete success. Let us look forward to deeper political mutual trust, robust common development and closer friendship between China and the UK. Let us embrace a 'Golden Era' of the China-UK comprehensive strategic partnership that is enduring, inclusive and mutually beneficial. Thank you! I will welcome any questions you may have in the time we have available. 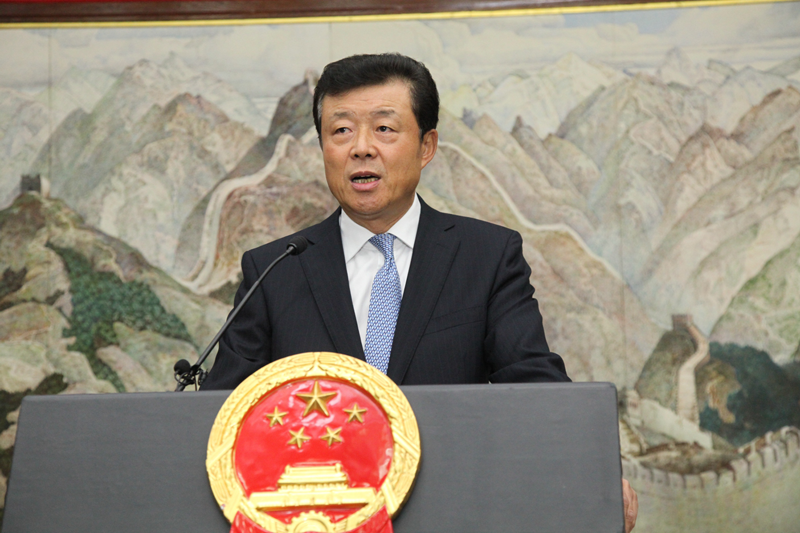 On 15 October, 2015, Ambassador Liu Xiaoming held a press conference at the Embassy on President Xi Jinping's state visit to the UK . More than 60 journalists from 35 Chinese and foreign media institutions were present, including People's Daily, Xinhua News Agency, CCTV, China News Service, China Radio International, China Daily, Guangming Daily, Economic Daily, Science and Technology Daily, Global Times, BBC, Reuters, Financial Times, Daily Telegraph, The Guardian, The Independent, ITV, British Sky News, CNN, Associated Press, CNBC, AFP, Russia Today, NHK, Yomiuri Shimbun, TV Asahi, Al Jazeera, Turkish State Television, Phoenix TV, Phoenix Finance and Economics, Sing Tao Daily, The UK Chinese Journal, UK Chinese Times, and GB Times. 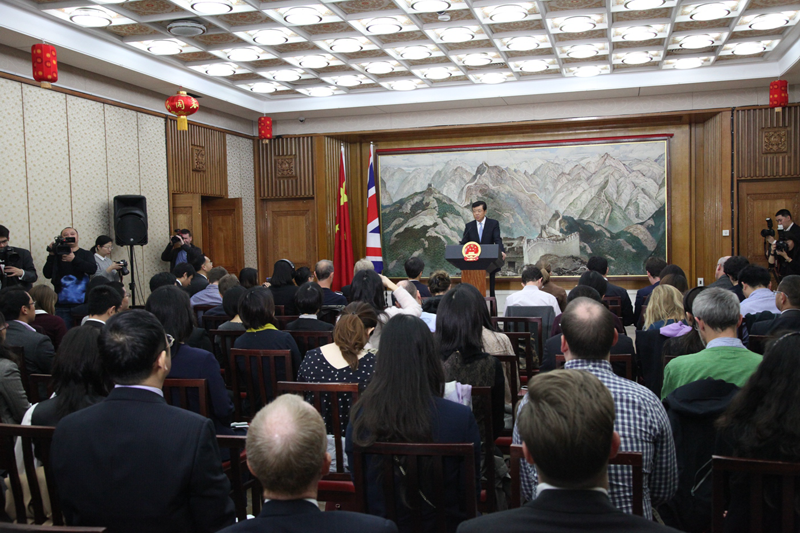 Ambassador Liu made the above opening remarks at the press conference and answered questions from the journalists on the agenda and potential outcomes of President Xi's state visit to the UK, China-UK cooperation in the fields of economy and trade, finance, culture, education and sports, the collaboration between China's One Belt and One Road initiative and the UK's "Northern Powerhouse", China-EU relations, UK-EU relations, relationship between China and the Labour Party, and human rights, etc.